A protest at a BP plant in Indiana landed three sixty something campaigners in a federal surveillance report, documents show. 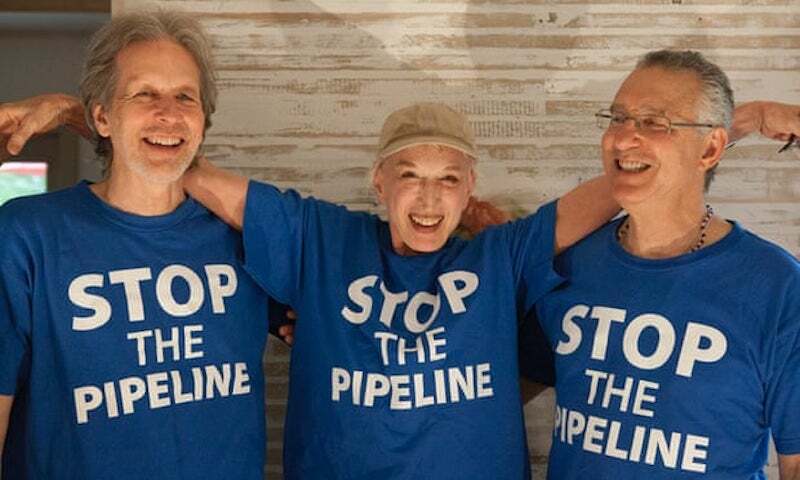 Thom Krystofiak, left, Inga Frick and Jonas Magram, climate change campaigners from Fairfield, Iowa, who were arrested at a protest in Whiting, Indiana, on 15 May 2016. Though there is no evidence the FBI has opened an investigation into 350.org, one of the documents, catalogued as part of a related domestic terrorism case, says: “350.org are referenced in multiple investigations and assessments for their planned protests and disruptions.” The file also makes an apparent reference to the 350.org founder Bill McKibben. The Break Free campaign took place over the course of a two-week period in May 2016 and included protests and acts of non-violent direct action on six continents. More than 30,000 people participated and dozens were arrested for trespassing and blocking rail access to refineries in what was described by the organizers as the largest coordinated act of civil disobedience in the fight against climate change. The 15 May protest in Whiting, Indiana, involved about a thousand protesters who marched to the BP refinery, one of the largest processors of crude oil in the country. When they reached the entrance 41 of the protesters gathered in a circle on BP property and sang a protest chant. For Jonas Magram, Thom Krystofiak and Inga Frick, all in their mid-to-late 60s, it was the first time they had ever been arrested. Frick, who is 67, said she was an unlikely activist but felt compelled to participate because of the urgency of addressing climate change. “I think that by far the most important thing that’s not happening in the world is not dealing with this,” she said. Magram, who is a part-time math teacher and turned 70 this week, was one of the organizers of No Bakken Here, an Iowa-based activist group that campaigned against the Dakota Access pipeline. Part of the pipeline runs through Jefferson county, Iowa, which includes the small city of Fairfield. The file referencing the three Fairfield residents was drafted by the Omaha FBI field office, which oversees all of Nebraska and Iowa. Though their names are redacted Magram, Krystofiak and Frick were the only Fairfield residents arrested in Whiting during the protest, according to Krystofiak. The subject of the file identifies the larger investigation or assessment as a “Sensitive Investigative Matter”, which often refers to cases that involve political organizations and therefore require a higher level of scrutiny from the FBI. Nebraska has been at the center of efforts to block construction of the Keystone XL pipeline, which activists and ranchers fear could threaten the Ogallala aquifer, one of the largest underground freshwater sources in the world. 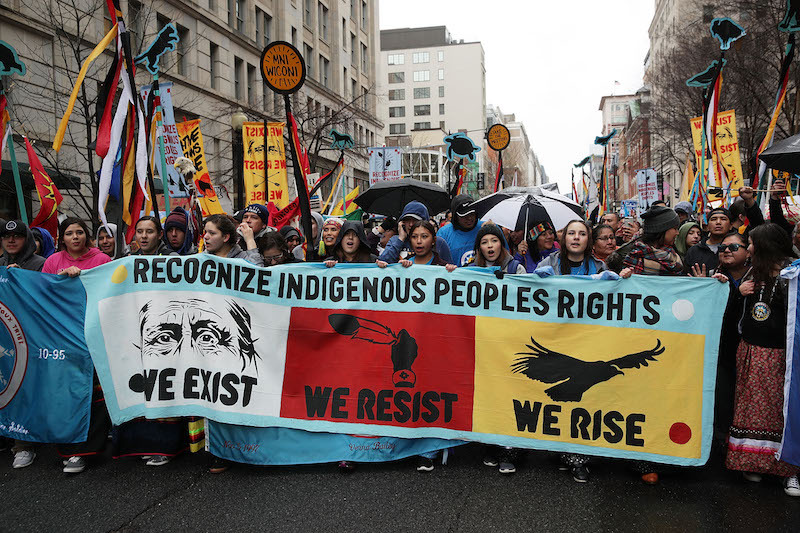 Now that the Keystone XL pipeline is again on the table – Donald Trump reversed the Obama-era decision to block the pipeline – activists have pledged to engage in non-violent civil disobedience if necessary. According to public records obtained by the ACLU, law enforcement is already coordinating efforts to crack down on pipeline protesters. Magram said he wasn’t surprised to learn he had been swept up in an FBI file but still found the implications disturbing. “It is very, very troubling that those of us who are committed to protecting life on our planet, through peaceful protest, would be regarded as suspected enemies of the state,” he said. Mike German, a former FBI agent and a fellow with the Brennan Center, said the FBI’s tracking of the Iowa residents’ arrests in Indiana was striking. “The fact that the FBI is tracking civil disobedience arrests and logging that information into FBI files is quite troubling,” he said. Absent intelligence indicating a planned act of violence German said there was little justification for creating such a file on individual activists and this was precisely what the 2010 IG report warned against. The FBI’s Los Angeles field office did not respond to detailed questions about the files. Reached by phone a spokesperson said: “I’m assuming the document speaks for itself if it was released under Foia.” The FBI’s Omaha field office did not respond to calls or emails. Based on the documents released, the FBI inquiry into 350.org’s planning around the Break Free campaign began with a request from the bureau’s Los Angeles field office for information on the upcoming events. The FBI appears to have relied mostly on open source material in its description of the protests including a webinar hosted by 350.org on 6 April. The file, dated 13 May, includes a detailed description of the planned protest in LA, which took place the following day. The FBI also noted that participants were encouraged to bring signs, bullhorns, musical instruments, snacks, food and water and that promotional materials had sought volunteers “willing to engage in civil disobedience and risk arrest to block access to ports or to ‘Stop the Bomb Trains’”. There were no arrests in Los Angeles. The Omaha FBI file described the action in Indiana as “a mostly peaceful protest” that ended in arrests after a small group of activists “broke away from the main group”, blocked traffic and trespassed. But Krystofiak disputed the FBI’s characterization of the day’s events. Because the march was permitted, law enforcement officials blocked off streets for about three miles and were in frequent contact with the organizers. Krystofiak said there was no traffic to block. Roy Dominguez, an attorney and the former sheriff of Lake county, which includes Whiting, negotiated on behalf of the protesters and said there were no disruptions. Some of the law enforcement officers even expressed their support for the protesters, Inga Frick said. German says the demonization of protest groups such as 350.org engaging in non-violent direct action has helped to fuel a militant police reaction such as the use of water cannons and rubber bullets at Standing Rock. “It creates a cycle where the drum beat of warning about potential danger from these things leads to a certain kind of response that increases the police violence that occurs at these protests,” German said.